2 of 3 Scatter 2 tablespoons bread crumbs over bottom of 11 x 7 x 1 1/2-inch baking pan. Place half the cauliflower on top. Pour 1-1/2 cups marinara over cauliflower. 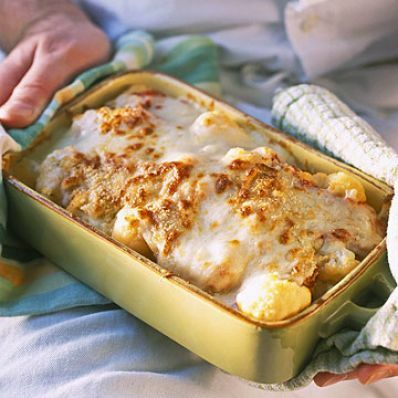 Sprinkle 1 cup mozzarella cheese and remaining 2 tablespoons bread crumbs over sauce. Repeat layering, ending with mozzarella. Cover with foil. 3 of 3 Bake in 375 degrees F oven for 40 minutes. Remove foil. Sprinkle top with Parmesan. Bake another 15 minutes or until Parmesan is melted and golden. Let stand 15 minutes before serving. Per Serving: 12 g pro., 156 kcal cal., 517 mg sodium, 4 g fiber, 4 g sat. fat, 19 mg chol., 6 g Fat, total, 15 g carb.